The year was 1884 when a young Spanish immigrant, Angel La Madrid Cuesta, first opened a small, handmade cigar factory. In just a few short years, Senor Cuesta earned a reputation as being one of the great handmade cigar craftsman of his day. He was soon joined by Peregrino Rey and together they founded the renowned CUESTA-REY heritage of premium quality cigars. Today more than a century later, Senor Cuesta's commitment to cigar excellence is commemorated with the Cuesta Rey Centenario Collection, Handmade by the world famous Tabacalera A. Fuente in the Dominican Republic. What makes the Cuesta Rey Centenario Collection so exceptional is the expert craftsmanship, as well as the smooth, rich flavor of these fine imported cigars. Every Cuesta Rey cigar is 100% handmade just the way Senor Cuesta would have made them in 1884. This is why each cigar is made firm and solid, while still providing an easy "draw". The Cuesta Rey Centenario Collection uses only the finest aged long filler tobaccos which are skillfully blended with Dominican Binder tobacco. This "bunch" is then hand-rolled with either Connecticut Shade "natural" or Connecticut Broadleaf Sun Grown dark "maduro" wrapper tobaccos. These "Vintage" wrapper tobaccos are aged for an average of five years before they are sorted for their color, texture, and overall quality. Only the finest wrappers survive this painstaking grading process, these superior quality wrappers are then given to the master cigar rollers who skillfully roll them with the bunches carefully created with their rolling partners. Finally every Cuesta Rey Centenario Collection cigar is aged inside a special cedar lined humidor for 120 days. It is at this point that the various individual tobaccos in the cigar become one smooth, compatible blend. The result is a consistently superb tasting cigar - one that would make Senor Cuesta so very proud. These are the finest non-Cuban cigars that I have personally enjoyed. Full flavor yet mild and burns very even from start to finish. 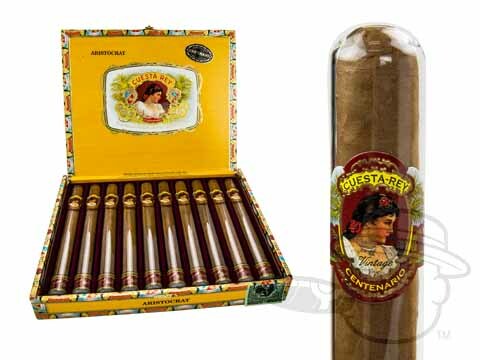 Cuesta Rey Centenario Aristocrat is rated 5 out of 5 based on 2 customer ratings. Does Cuesta Rey have a Sampler? Cuesta Rey's Centenario line does not have an assorted sampler, though the Cuesta Rey Centenario #60 does come in a smaller 5 pack sampler.